This dish is just a slight variation of the baked mussels I have featured before, this time using scallops. Everything came from the grocery, and it was dead easy to make. Buy some fresh or in this case, frozen scallops on the half shell. Heat your oven to 400F or higher. Melt some butter with minced garlic in the microwave, a step I like to do to avoid raw garlic on the shellfish which can be annoying. 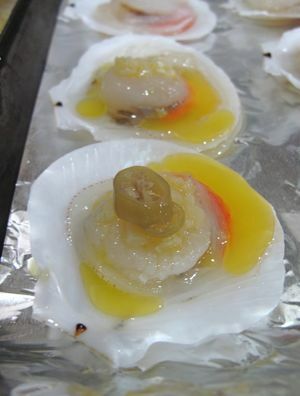 Sprinkle each scallop with some butter garlic mixture, then add a slice of pickled chili if you have it. Alternatively you can go with a small piece of chorizo or chinese ham. Then cover with a mixture of grated cheese and panko bread crumbs. Add some salt to the scallops if you like. i tried these with a motoyaki topping (made essentially with, but not limited to, japanese mayo, miso, onions, sugar, egg yolk) and turned out quite nice as well. Yup mayo and miso like one paul mentioned above is good too ! This recipe also works on barbecue. this is a good recipe. this is served at the japanese buffet restaurant we often go to…. It’s been so long since my last baked scallops — so thanks for this great idea, as you said “so easy and so incredibly delicious”. Where did you buy your frozen packs MM? 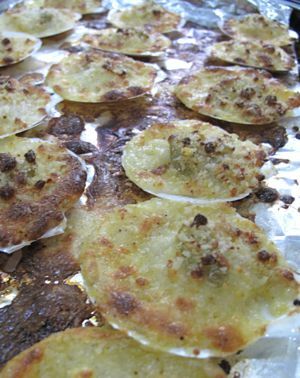 Mom-Friday, I used to see these scallops on a half shell at Cold Storage stalls in Rustan’s Supermarket. @Mudra: Panko breadcrumbs are also known as japanese breadcrumbes, the one they use for tempura. They’re bigger than regular breadcrumbs and give more crunch when cooked. They are readily available in supermarkets as they have gained more popularity for use other than tempura. Hi MM, am just wondering, what kind of cheese did you use? Gruyere? oh wow- might head over to cold storage to grab me some scallops for later! yummy!best appetizer to go with the best wine..
hi marketman! i make clams and mussels with all the ingredients that you said, minus the cheese, plus chopped celery, lemon and parsley! yummy! Hershey, more often than not, parmesan is the cheese of choice in this type recipe. 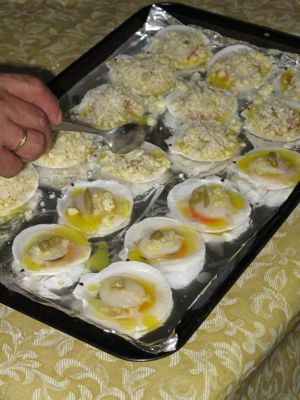 What is Scallops in Tagalog? Same goes to Oyster, Mussels, Clams. Thanks! Hi, to those who want to order scallop fresh meat, you may email me at fletchmortel@yahoo.com. Thanks. I just bought a half a kilo in the market in Bacolod for 140 peso. I have never had em before, i will try tonight. Tagalog: Oyster – Talaba, Mussels – Tahong, Clams – Halaan. No idea what scallop is in tagalog.